At Easy Street Cycling we teach big kids how to ride bikes safely and legally with traffic in Street Skills camps and classes. Easy Street Cycling believes kids who learn to respect traffic become safe, confident and responsible community members. Kids adopt life-long lessons of problem solving, assertiveness, independence, respect for the environment, being active and the joys of riding a bike. But don't just take our word for it. Check out what other parents have had to say about our programs. Bonnie has been road cycling long distances for almost 20 years including a ride across the country. started Easy Street Cycling Bike Camps for Alameda Middle School Kids to learn to ride safely and independently in 2014. She enjoys the rewards of coaching kids on the fun and freedom of riding bikes. Bonnie's coached hundreds of kids and adults for over six years, is a Safe Routes to School Parent Champion, a Bike Walk Alameda Board Member and mom. "I feel lucky to get to work with adults and kids and see their confidence emerge while they have fun mastering riding a bike in traffic. Helping people of different ages and physical abilities enjoy and feel comfortable riding a bike is a great job!" 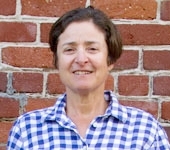 Diane has been a League Certified Instructor for over 15 years teaching kids and adults bicycle safety in San Francisco and the East Bay. "My main interest is in people, personal growth, becoming happier, healthier and more aware. Teaching people to learn to ride a bike, ride more safely, courteously and more easily allows me to grow and constantly learn, creating a virtuous cycle of increasing happiness." Dan is spending much of his adult life confirming what he learned as child. Playing is great and the bicycle is our species’ finest invention. Dan is convinced of the power of recreation to change lives, communities, and ecosystems. After certifications in sea kayaking and rock climbing, his favorite ‘work’ still involves cycling. He’s been a cycling instructor since 2008 and loves teaching cycling in the East Bay community. Dan now coaches and manages Bike East Bay’s large group of bike education instructors. Maya loves teaching kids as well as adults who are ready to learn some new things about riding. Maya has a wonderful calm that puts any rider at ease. She was raised in the sunny and foggy city of Berkeley where she was able to ride a bike to high school everyday, and never stopped riding. She has been teaching bike education for almost a decade, teaches with Bike East Bay and is a co-founder and collective member of Cycles of Change.